The American shipyard the Burger Boat Company has been building luxury yachts since 1863. One of its creations is The Lady Grace Marie, launched in September 1998. This motoryacht is built around four bridges, of which one is below and two above the main deck. Sleeping arrangements on this yacht are in two double cabins with private bathroom in the stern area, a large owner's suite mid-ship with private bathroom and dressing room, large double cabin at the bow, also with private bathroom, as well as the crew's quarters. The design was developed by the naval architect Don O'Keeffe while the interior was designed, in conjunction with the owner, by Douglas Richey and by A.S.I.D. The designers' and naval architects' studios which contributed to the Lady Grace Mariès design, worked in tandem with the shipyard's design team who set the necessary conditions for producing a yacht capable of meeting its owner's space requirements. The hull is displacing and the line is classical; the shipyard has not employed flamboyant forms but has created an elegant, beautiful yacht which will not go out of fashion for a long time. For further information contact the Burger Boat Company; 1811 Spring St. Manitowoc; WI 54220 USA; tel. 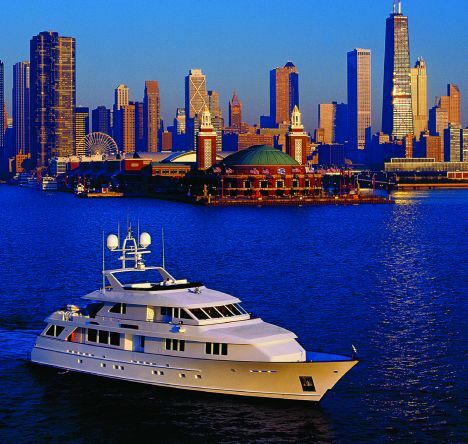 920 6841600; fax 920 6846555; web-site web www.burgerboat.com; email bys@burgerboat.com.